Please click on the larger calendar link above between About and Contact Us. Then choose Agenda view for a better view of the activities and classes scheduled. Below are some of the class descriptions I teach. I try to cater to many levels so everyone, regardless of age, ability and/or inclination can have an inspiring outdoor experience. Learning how to use poles helps walkers & hikers improve endurance, posture, balance, confidence and strength and enhances your enjoyment of the outdoors all year long. All levels focus on learning anatomically-optimal techniques to achieve your desired performance while learning how to avoid joint stress or strain. Carefully select the class that best suits your physical ability and inclination. A variety of top quality poles are provided at all seminars. – Beautiful hiking locations are based on the season/weather. 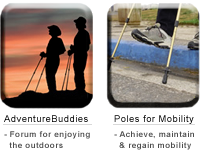 – Mobility class locations offer indoor training and lovely/easy pole walks for practice. POLES: HIKING POLES BASIC SKILLS & TECHNIQUES Morning session helps hikers learn poles, trail and body skills. Beginner to experienced hikers learn techniques without the additional challenge of the practice hike in afternoon. Uphill: Improve power, endurance and spine function. Downhill: Develop skills for feeling safer and preserving joints – Save your knees! Optional continuation of morning session. Stunning views on lovely, complex trails while practicing/enhancing poles skills. Improve your performance and learn additional techniques for navigating trickier and varied terrain. “Test drive” different models to learn which best fit you or bring your own. Mileage varies, approximately 4 ti 8 miles. Previous pole hiking instruction REQUIRED. POLES: SKILLS & TECHNIQUES PLUS PRACTICE HIKE Experience everything in the Basic Skills & Techniques class PLUS a FLOWER Hike. Learn individualized strategies for improving your performance on varied terrain. “Test drive” different pole models; learn which poles fit you best and will help you achieve your goals. Mileage varies, approximately 4 ti 8 miles. Hike, Stretch, Strengthen, and Breathe! Practice pole hiking skills, improve your trail performance while mindfully experiencing cool Redwood trails. Interspersed stretches and strengthening movements focus on improving longevity, injury prevention, joint health and structural stabilization. Mileage varies, approximately 4 ti 8 miles. POLES FOR BALANCE & MAINTAINING MOBILITY Easy-to-learn pole techniques and gentle exercises empower people to maintain independence, navigate everyday obstacles, reduce risk of falling, restore spine function, improve stamina and walking form. Strengthen muscles that support weight bearing joints. Optional lovely practice pole walk – approximately 1/3 mile. Special equipment provided. Refine, enhance and learn new skills on gentle, varied terrain. EASY practice hike – connect with nature while you improve confidence, pole performance and body awareness. Explore Beautiful Native Garden: Botanically experience California in Springtime. Approximately 2 miles. FITNESS FOR THE TRAIL & FOR LIFE! Pole Instructor recommends this (NON-POLE) class for everyone! Six key elements determine your ability to maintain physical fitness. This interactive session progressively helps you create a more structurally-solid foundation. Individualized movements focus on improving joint health, balance, posture, endurance, flexibility and strength. Bring your body.